It’s our very FIRST Tampa Bay Tuesday! If you suffer from pain….whether it’s back pain, knee pain, plantar fasciitis…..or any other pain that prevents you from doing the activities you love to do……our guest this week is going to help you get rid of that pain for good! I want to introduce to you our newest Weight Loss Nation Tampa Bay mentor, Allison Hollister! Allison is a licensed massage therapist as well as a Structural Energetic Bodywork Therapist. What’s a Structural Energetic Bodywork Therapist? Structural Energetic Therapy is a total body therapy that produces maximum rehabilitation of physical conditions causing pain. SET® is the integration of cranial/structural techniques with specialized soft tissue protocols designed to work together to restore balance, strength, and function in the body long term. Allison received her certification and license as a Licensed Massage Therapist. After a close friend suffered traumatic injuries from a car accident, Allison watched her friend recover more quickly by seeing a Structural Energetic Bodywork Therapist. Therapeutic Bodywork changed Allison’s life. Allison went on to study Therapeutic Bodywork and became certified as a Structural Energetic Bodywork Therapist herself! Today, Allison has an established and successful Therapeutic Bodywork business. Allison Hollister is passionate about helping people live balanced lives. What a perfect fit for Weight Loss Nation Tampa Bay! Allison is here to help you understand what Therapeutic Bodywork is…but more importantly….how it will relieve your pain and balance your body so that you can go back doing activities that you love to do! If you live in the Tampa area and are suffering from pain… contact Allison and schedule your 1st appointment now! The pain STOPS here! 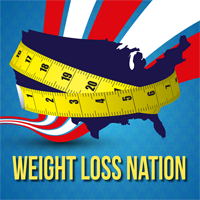 Want to become a member of Weight Loss Nation Tampa Bay? Go to the website and join monthly or for one lifetime payment. For the inauguration of our 1st season of Weight Loss Nation Tampa Bay, I am offering an awesome price for our monthly program. You won’t find this incredible deal on our website! You have to be a Weight Loss Nation listener to learn about this offer. and I’ll send you the link for 12 monthly payments of just $20.18. This price is only good until Valentine’s Day, which is February 14, 2018. After that ……the monthly price goes back up to $39.99. I will send you the link to sign up for our monthly program for 12 months at just $20.18 a month. You can go to the website and pay a one-time lifetime member price of just $297.00 right now. The Lifetime member price is going away forever after Valentine’s Day! So……join us today and take the journey with me and other Weight Loss Nation Tampa Bay Members as we LIVE a Healthy Lifestyle Together!